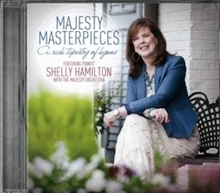 Majesty Masterpieces features acclaimed pianist Shelly Hamilton accompanied by the Majesty Orchestra. You will listen to these beautiful piano-concerto style arrangements over and over again. Shelly, Brian Buda, and Shelton Ridge Love have collaborated to create this unique collection of well-loved hymns that can by used in a variety of ways. The printed book (sold separately), contains the entire collection arranged for two pianos. In addition, the full orchestrations (sold separately), are also available allowing the arrangements to be performed as piano concertos. Each original arrangement will cause you to reflect on the beauty of God and worship Him anew. $0.99 2. What Wondrous Love is This?